We have been playing for more then 15 years! We mainly play for fun, with the occasional friendly game or competition for those who are more competitive. We run training for adults on Tuesday evenings 19.00-21.00, adult beginners/casual Sundays 17.00-18.00 and for children (5-13) also on a Sunday 17.00-18.00, see the calender to the left for details. We happily accepted new members with or without any previous floorball experience! We try an attend local event when possible to spread the floorball word to both adults and children, such as the Big Weekend in Cambridge (see picture). How do I join Cambridge Floorball Club? - We currently train every Tuesday 19.00-21.00 and Sunday 17.00-18.00 at Chesterton Sport Centre. You can see a list of upcoming trainings to the right. Anybody interested is welcome to join, or just come along to try it. We play mixed teams so both male and female players are welcome. Don't hesitate to send us an e-mail, or just pop down to a training session. I don't want to play but my kids are really keen, what do I do? - We run training for children aged 5-13 (older teenagers are welcome to the adult training) every Sunday, 17.00-18.00. The training is also at Chesterton Sport Centre. The trainings are run in line with term time and the first one is free to try out and then it will only cost £16 per term! We have sticks to borrow so don't hesitate to send us an e-mail, or just pop down to a training session. What equipment do I need? - Not much, sticks are available to borrow for those who don't have one. Just bring yourself, indoor shoes, a pair of shorts and a T-shirt. Not sure what floorball is? - The name Floorball is actually a bit daft (floorball could mean anything where a ball is used on a floor). Other names for it is Innebandy (in Swedish), Salibandy (in Finnish), Unihockey (in German/Swiss). The game Uni-Hoc, which is played in many English schools, is very similar to floorball. Floorball is a relatively new sport in the UK with only about 20 recreational clubs active at the time of writing. All the clubs are open both for men and women, mixed teams. For more information on Floorball in UK have a look at United Kingdom Floorball Federation home page. 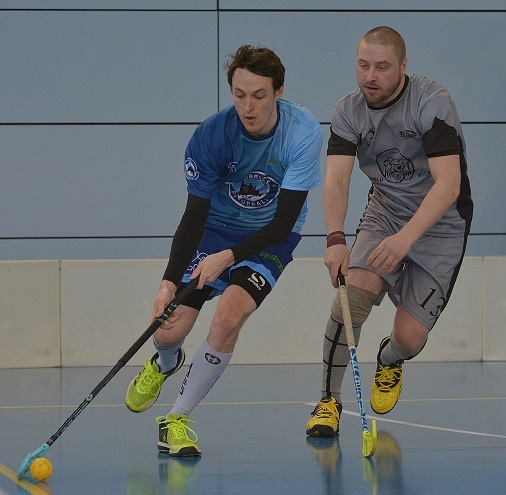 If you're interested in playing, but don't live in the Cambridge area try some of the links to other floorball clubs in UK. For an introduction to the game have a look here for a quick guide to some of the rules. Also this page gives has details on some of the more advanced floorball tactics. How much will it cost? - Since we don't have a sponsor at the moment we pay for the sports halls ourselves, currently the Tuesday practice is £5 per 1h session or £8 per 2h session (half price for goal keepers). The adult practice on a Sunday is £3 per session. The first session is free! So there's nothing holding you back from giving it a try! Want to know more? - Contact us by email if you need further information (if you don't have access to an email client then there is an online form here). Alternatively, just turn up to a practice session. We are happy to here from beginners and experienced players alike, not to mention any other teams interested in a friendly!